If you are self-publishing on Amazon Kindle Direct Publishing (KDP), this is a must-have free app for you to use. The program has improved considerably over the last couple of years. Initially, it was a little unstable and its basic function was to help you format a Kindle book. But stability is much better now and Amazon has been slowly adding new features since it merged Createspace into KDP. While still in beta, Kindle Create can now format paperback books as well. It is also now available in more languages. Kindle Create supports eBooks in Dutch, English, French, German, Gujarati, Hindi, Italian, Malayalam, Marathi, Portuguese, Spanish, and Tamil. If you are not familiar with it, here is a short Kindle Create how-to guide so you can get started. Go to your KDP dashboard and make sure you are logged in. In the help section, navigate to Tools and Resources and then Kindle Create. Or you can just click this link to go directly to the download page. It is available for PC or Mac. Choose your preferred version and install the software. It is a straightforward installation process. When you have installed the program and launched it, you will see the welcome screen. But before you start, make sure you go to Preference Options and change one setting. Early access ensures that you have all the latest beta features that are available. If you want to format paperback books, you need to have early access ticked. Be aware, however, that by ticking this box you will be using beta features that might not be working absolutely perfectly. Click save after your choice and return to the home screen. Now click on New Project From File. You will see this screen. You can only upload a Microsoft Word file in either .doc or .docx file type by using the first option. One is to upload .pdf files for comic books. The other is to work with text-heavy textbooks, cookbooks and music books. 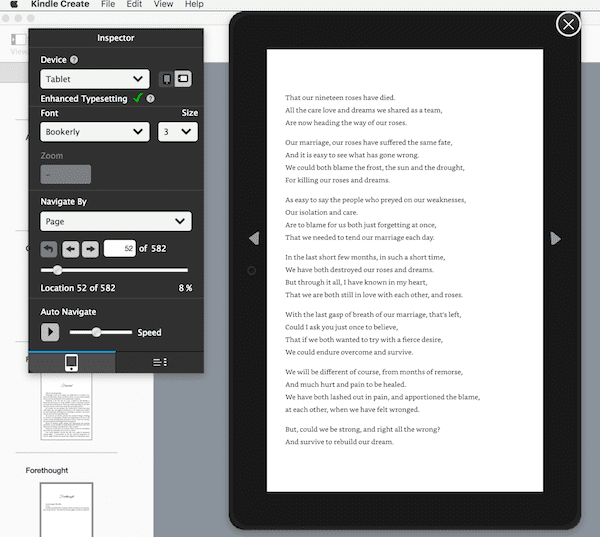 This option also allows you to transform PDF files into interactive Print Replica ebooks. Also, the last option allows the inclusion of interactive elements such as video that can be viewed using the Adobe Flash Player on certain Kindle devices. For most authors, however, you will choose the first option and start working from your Word file to format Kindle ebooks or print books. 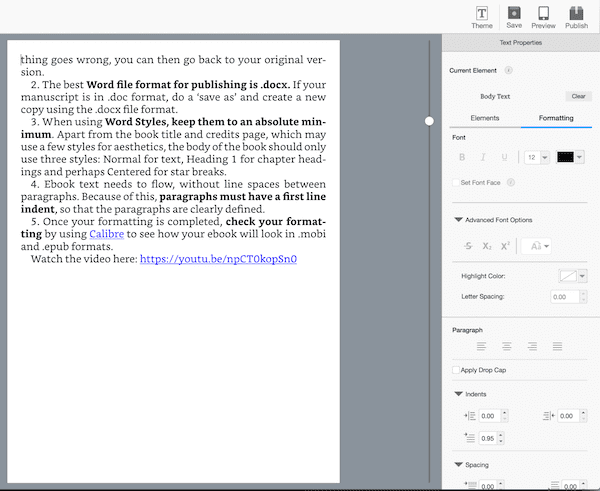 Once you select your .doc or .docx file and open it in Kindle Create, the program will start a short conversion process. When it completes, you will see that the app automatically tries to create a table of contents. You can see it in the top left-hand corner of the screen. If you have used Heading styles in your Word document for your chapter headings and book title, the table of contents should be correct. If your chapter titles are not correct, to solve the problem, navigate to each chapter first paragraph and set the chapter title using the buttons under the Elements menu on the right-hand side of your screen. You should then save your changes. This will create a new file of your book. 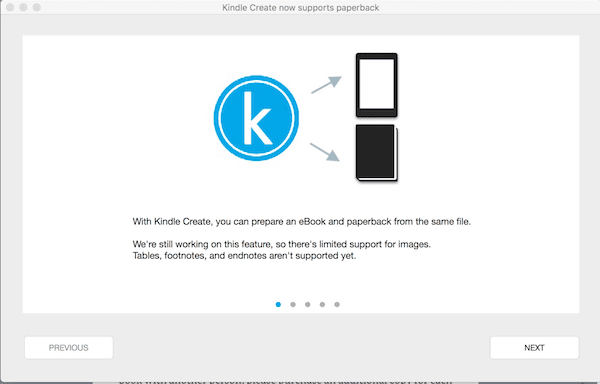 The file Kindle Create uses is .kcb. 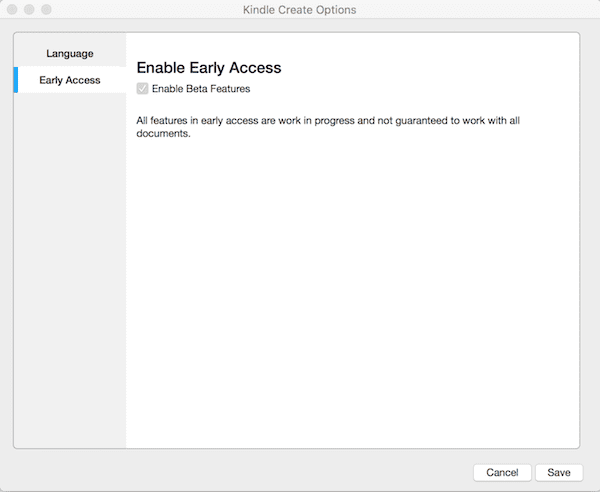 If you have Early Access ticked, you will get a reminder screen pop-up from time to time to tell you that you can prepare your ebook and print book using the same file. The pop-up is a bit annoying, but the time saving is well worthwhile. There is no need to have two separate files of your manuscript for each version. 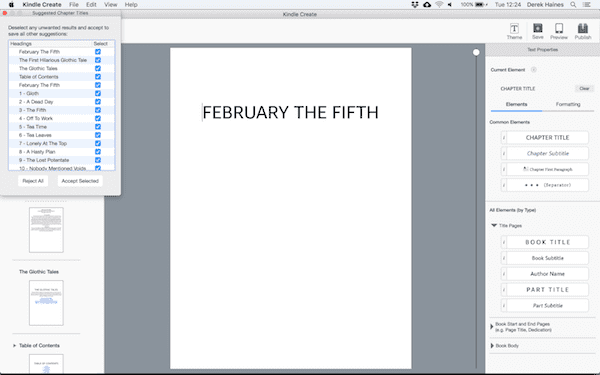 Formatting with Kindle Create is similar to how you would do so with any word processor. Use the formatting menu to make changes to your body text fonts, apply drop caps, change paragraphs, indents, justification and line spacing. Keep in mind though, that any fancy fonts you choose to use will work for a print book. But they will be replaced by the standard fonts that are available on Kindle devices for an ebook. You can take a quick shortcut to your formatting by selecting a pre-set theme. Click the theme button at the top-right of your screen to make your selection. 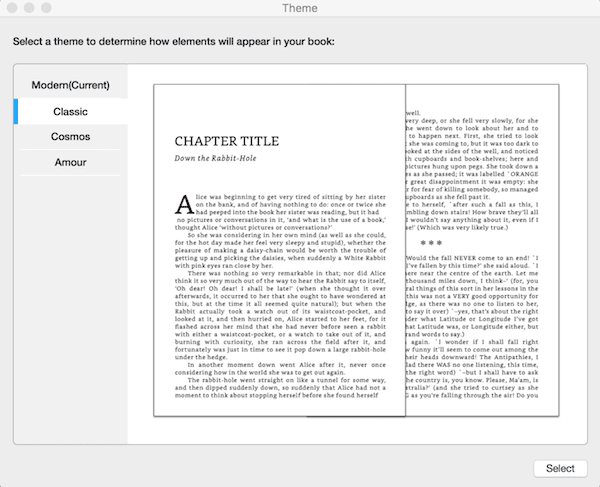 As you make changes to your book formatting, you can preview your ebook for Kindle, tablet or phone. It is the best way to be sure that your book looks great on all device sizes. Once you have finished formatting your book, you will then need to click on the Publish button. It will create a new .kpf publishing file that you can then use to upload your ebook to KDP. The program is not a word processor, but you can certainly make small changes to your text. 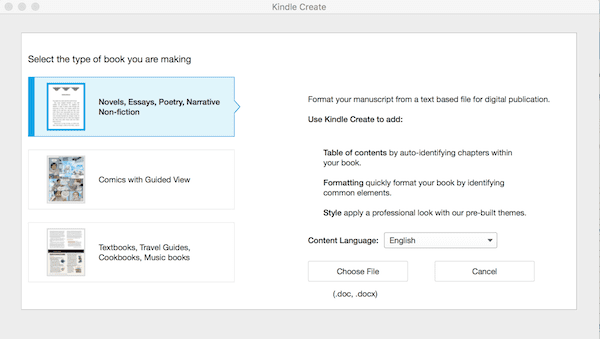 However, your original Word file will not be overwritten because it is only imported into Kindle Create. So make sure that your manuscript Word file is perfect before you start formatting. You should only start formatting your book after you have done a full and thorough grammar and spelling check and completed your proofreading. As far as preparing your books, there are some issues that you should be aware of before you rush into publishing using this program. Customisation of margins, headers, page numbers, font. You will not be able to customise the margins, headers, page numbers, and font. Left-page headers will show the author name, right-page headers the book title. The alignment and style of the author name and book title can’t be changed. They will start on the first page of your book’s first chapter. Font and font size for paperbacks can’t be changed. For some authors, these issues might be a drawback. If so, it is best to stay with formatting your print books using Word and exporting to .pdf for your publishing file. But for ebooks, the software is excellent now and it is a great tool to ensure that your book will be perfect for ebook readers. Another cause can be a bug in your .docx Word file. If you get an error using a .docx file, try saving your Word file in a new .doc file and try again. These issues are rare now, but at least you have a way to fix them if they strike. 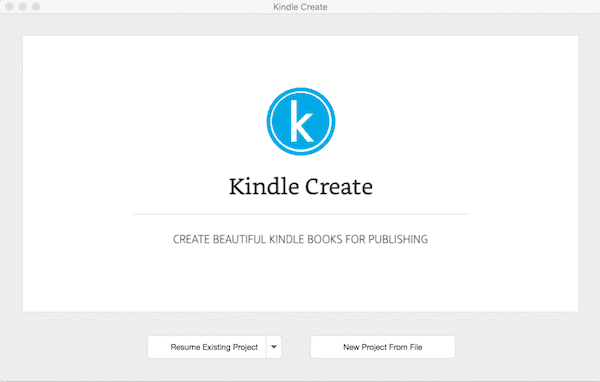 Kindle Create is a handy tool to have if you are self-publishing ebooks on Amazon KDP. For print books though, I think it is early days. It is still a new beta feature, so there will be more development to come, and hopefully, Amazon will address some of the current restrictions in the future. I have used it for ebooks and it was an easy process from formatting right through to publishing. The final result was always perfect. But I would not recommend it just yet for paperback publishing. Once this feature is out of the beta stage, it might be worthwhile, but it still has some way to go. For more information, you can watch this short video.